For many home owners, the motivation for improving the energy efficiency of their home is to cut running costs and maybe do what is possible to reduce energy usage and waste for the sake of the environment, being a bit more green and reducing that carbon footprint. For some there is a recognition that an energy efficient home will be a plus point when itÃƒÂ¢Ã¢â€šÂ¬Ã¢â€žÂ¢s time to sell up and move on but apart from attaining a higher EPC rating, a lot of energy efficiency lead home improvement projects add value to your property, in tangible and practical ways. For example, most energy efficient doors have high security features, replacement double glazing freshens the look and feel of a property, new boilers are more reliable and roof insulation can strengthen your roof and transform the usability of loft space. 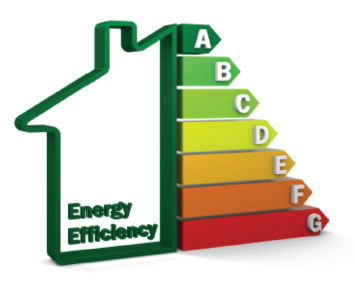 Anyone buying or selling a house these days will more than likely have paid some attention to the EPC or Energy Performance Certificate. This certification provides a rating from A (Most Efficient) to G (Least Efficient) and contains details about the property energy use and costÃƒÂ¢Ã¢â€šÂ¬Ã¢â€žÂ¢s based on an accredited assessors report. The assessor will typically take into consideration, walls, roofs, windows, heating system, lighting, heating controls and hot water supply. Your rating will be based on these aspects of your home, here is an example. Shop around online for the best deal, get higher Lumen (brightness) bulbs for rooms that need more light. They will be more expensive than regular bulbs but boy, do they last! Most houses built after 1990 will have wall cavity insulation, if your house is older, it is definitely worth checking. Modern double glazing is a must and one of those win win projects that keeps your home warm, noise free and looking great. Read our article on window maintenance or check out our double glazing pages if your current windows are getting on a bit. Often overlooked as an energy efficiency lead project but old and ill fitted doors sure are draughty. New Composite Doors will not only reduce heating cost but will improve security, look smart and be low maintenance. See our range of composite doors for some inspiration. When do old boilers break down? When you most need them is probably the most popular answer to that question. Chances are that if you have an old boiler then the controls are old as well, apart from the energy efficiency and reliability of a new boiler having smart controls, such as NEST, helps to reduce energy waste by only heating radiators and water when you really need it and to the temperature that is required at the time. County Windows supply and install new boilers, hassle free with a 10 year guarantee, check our Replacement boiler page for the latest offers. ItÃƒÂ¢Ã¢â€šÂ¬Ã¢â€žÂ¢s not just savings on your fuel bill, the home improvements that you make will be an investment, increasing the value of your home and making it more desirable to potential buyers. If your not selling up just yet, then feeling the benefits and enjoying the home improvements that you have made is well worth the investment. County Windows have many products that all help towards the energy efficiency of your home, from Weatherboard Cladding to Roof Insulation, browse our website for more information and our latest offers and 0% finance deals ÃƒÂ¢Ã¢â€šÂ¬Ã¢â‚¬Å“ LetÃƒÂ¢Ã¢â€šÂ¬Ã¢â€žÂ¢s get your project started.